There are three bus stations in Cancun, but the main depot is at the corner of Tulum and Uxmal Avenues (right on the federal highway 307 as it cuts through the city of Cancun). The Cancun International Airport also has regular departures (every 30 minutes) from each terminal. A bus ride from the airport to the main downtown station is under 20 minutes. From there you can easily catch a taxi (or even a city bus) to get to your hotel. 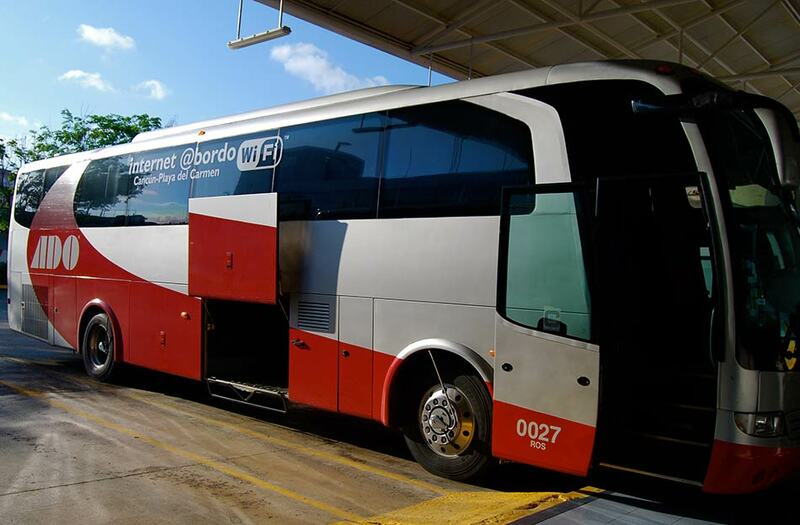 ADO, Mexico’s leading bus line, has a website showing schedules and routes: www.ado.com.mx However, be warned! In order for you to purchase a bus ticket online, you must have an account set up with ADO (which is fairly simple; just an email and password), and you can only buy the tickets if you have a Mexican debit or credit card. Very frustrating to navigate, which is why your best bet is buying your ticket at a kiosk. Are you a bit nervous when you think of riding a bus in Mexico? Perhaps you have heard some “horror stories” and are envisioning that you’ll be standing for 3 hours or crammed in a poorly-ventilated vehicle with live chickens in your lap! This does not have to be the case for you at all. Mexico has an excellent bus system, with the most modern, well-equipped vehicles. The quality honestly puts the US or Canada to shame. You do have your choice between plush executive class buses and more economic options, depending on the route you need. Many of the buses are now equipped with Wi-Fi! Air Conditioning, 44 reclining seats, bathroom, 3 monitors for movies, certified drivers, each bus has air-purifying technology. This is the standard bus that runs south from Cancun to other cities such as Puerto Morelos, Playa del Carmen, Puerto Aventuras, and Tulum. ADO has the most destinations and frequent departures in Mexico by far. Air Conditioning, 25 seats that fully recline into a bed, separate bathrooms for men and women, electrical outlets, personal entertainment system with more than 50 options of movies, TV series, and music. Air Conditioning, reclining seats, 4 video monitors, individual reading lights, bathroom. Things in Mexico are always changing–and that includes pricing and scheduling–but it is usually painfully slow for those changes to be implemented. If you are thinking about traveling by bus, know that it is a very popular and common form of transportation in this part of the world. If you are able to get to the bus station, you’ll be in good shape. 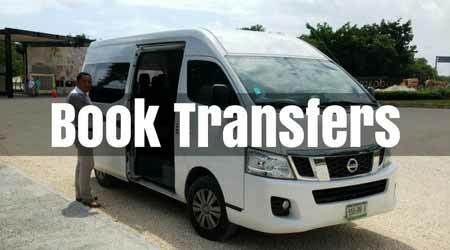 Buses depart at regular intervals to all cities within the Quintana Roo and the Yucatan. The Cancun bus system works just like any city bus system, sorta. You find a main street and look for a bus stop sign. Usually a blue or black sign with a picture of a bus. Stand there and wait. A bus will stop, you get on and pay. Cost: 8.5 pesos per ride. Peso coins only. American dollar bills are okay but expect not to receive any change unless you ask; even then you may not get it. You will receive a bus ticket. Know where you are going…or at least know the destination. Look out the window and watch for your intended location. If you hear anybody speaking your language on the bus ask them if they know your destination and how far, what side of the road. When you get to your destination move quickly. Ring the dinger if it works. If it doesn’t work scream stop [Spanish: alto] and move to the door and exit. NOTE:Do not rely on asking the driver to stop at your destination. Even if you do and the driver says okay, chances are he will forget. You will not know and end up at the end of the line in the middle of nowhere, wondering what to do next when the driver gets off the bus for a taco break. There are 4 bus routes R-1, R-2, R-15, R 27. R-2 R-15 go to Wal-Mart & Mercado 28. R 27 travels on Tulum Ave and stops at Plaza Las Americas where you catch the colectivo to go south up Hwy 307 to Playa del Carmen – Tulum and all points in-between. The colectivo bus system is made up of mini-vans that run from Cancun to Playa del Carmen then from Playa del Carmen to Tulum, and back, all-day, every day. You get the colectivo in downtown Cancun in the parking lot of “La Comercial Mexicana” on Tulum Ave.
La Comercial Mexicana is open daily from 8 AM to 10 PM. You can catch a colectivo anywhere on Hwy 307 from Cancun to Tulum. 2nd Class run from this station as well. There is a bus that runs from this station to Cancun Airport every hour during the day. The new bus terminal is located on the corner of avenidas Tulum and Uxmal.